The Seward County Lady Saints broke out the brooms on Wednesday afternoon at Lady Saints Field in Liberal and it wasn’t to do housecleaning. Seward took it to previously undefeated Northern Oklahoma-Enid, sweeping the double header with the Lady Jets with 2-1 and 9-1 wins to improve to 13-2 on the year. The first game of the double header was a pitcher’s duel early on with each side managing just one hit through the first two innings of the contest. The scoring got started in the 3rd when Seward starter Katelyn Craker walked the leadoff hitter who later scored on a Seward defensive blunder to give Northern Oklahoma a 1-0 lead. Seward had a chance to answer in the bottom half of the inning as they put two runners on with two outs, but a fly out ended the threat and the inning to keep the Lady Jets in front 1-0. The Lady Saints finally broke through in the 4th, using the same formula that Northern Oklahoma did in the 3rd as they got a leadoff walk and an error later in the inning to score their first run to tie the game at 1. After a bunt single from Felisha Vogelaar, Marissa Chavez hit a deep fly ball to center field for a sacrifice fly to bring Seward’s second run of the inning home to put them in front for the first time in the game 2-1. Craker locked in for Seward from there on out. The sophomore lefty breezed through the Enid bats in the 5th and pitched another 1-2-3 inning in the 6th to keep the Lady Saints in front 2-1. Seward wasn’t able to add an insurance run in the bottom of the 6th but it didn’t matter. Craker got two quick outs in the top half of the 7th before a double and a walk put two runners on base, but once again she came up big when the Lady Saints needed her to, getting a fly out to end the game and give Seward County the 2-1 win. Craker allowed just 3 hits in the win while striking out 4 to move to 7-0 on the year. Seward managed just 5 hits in the victory, getting 2 from Vogelaar at the bottom of the order. Chavez picked up the lone RBI for Seward in the win while Danielle Orr and Tiffanie Bolanos scored the two Seward runs. The Lady Saints played from behind once again in game two as Northern Oklahoma jumped on the board first, taking advantage of a pair of Seward errors in the top half of the 2nd to grab an early 1-0 lead. Seward answered back in the bottom of the inning as Becky Allen was hit by a pitch and Orr singled to start the frame before a sacrifice fly from Vanessa Oakden scored Allen to tie the game at 1-1. On the first pitch to the next batter, Tiffanie Bolanos, every softball players nightmare happened as Bolanos squared up the first pitch she saw and lined it right back up the middle where it hit Enid pitcher Marissa Dominguez off the side of the head before bounding into the right center field gap on the fly. The play put Seward ahead 2-1, but more importantly, Dominguez was able to walk off the field after the play and looked to be alright later in the game. Now with the lead, Seward pitcher Brittany Hopkins settled down from there. Hopkins worked a quick top of the 3rd and got three ground balls to shut down the Lady Jets in the 4th to keep Seward in front 2-1. The Lady Saints added to their lead in the 5th as they first nine hitters of the inning reached base, pushing across six runs to blow the game open. A one out error allowed the first Seward run to score and an RBI single from Orr made it 4-1 Lady Saints. Carmen Hughes then lined a single down the right field line to score two more to make it 6-1 and later in the inning Vogelaar ripped a single to plate a pair of runs to open the Seward lead to 8-1. Hopkins worked her fourth straight scoreless inning in the 6th and her offense rewarded her in the bottom of the inning once again as Pokey Ewell doubled to start the inning and Allen singled her home to force the run rule as the Lady Saints won 9-1. 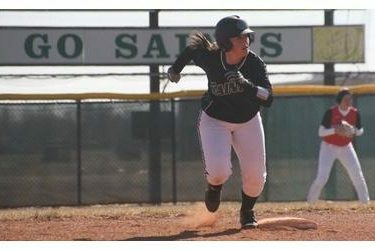 The stat sheet was dominated by the Lady Saints who outhit Enid 12-4 in the victory. All nine Seward starters had a hit in the victory including 2 hit games from Andrea Sitter, Orr, and Bolanos. Three other Seward players, Vogelaar, Hughes, and Allen, had 2 RBI’s in the win and Ewell scored 2 runs. Hopkins earned the win in the circle, going all 6 innings of the contest and allowing just 4 hits, all singles, without walking a batter. The Lady Saints continue their strong start to the season, improving to 13-2 overall with the two wins while Northern Oklahoma-Enid suffers their first two losses in program history, falling to 10-2. Up next for the Lady Saints is a quick turnaround on Thursday when they hit the road to Borger, Texas to take on Frank Phillips for the second time this season.